The USB3-16U1 USB 3 Hub with DIN-Rail mounting options provides an ideal solution for expanding your USB applications by 16 USB 3.0 ports. Also supports Sync and Charging Simultaneously. Provides a wide range self power source (+ 12-24VDC from 2-pin Terminal Blocks) in order to supply enough power on USB 3.0 buses. Standard Screw Lock cable support for all ports. Use USB 3.0 Type-A ports to Sync and Charge Simultaneously. Supports USB Super-Speed (5Gbps), High-Speed (480Mbps), Full-Speed (12Mbps), and Low-Speed (1.5Mbps) data speeds. The USB 3 Hub (USB3-16U1) with 16 ports features (16) Type-A downstream port connectors for USB 3.0, USB 2, USB 1.1 devices. All ports support Sync and Charge functions simultaneously, standard and screw-lock type USB cables for a secure connection. The 2-Pin self power input connector uses 1 pin for positive voltage and the other pin for a GND connection. 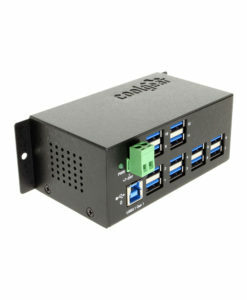 The USB 3 Hub terminal block connector is used to connect strong power in order to self-power the hub (Power supply not included). The voltage can be in the range from +12V to 24V DC. 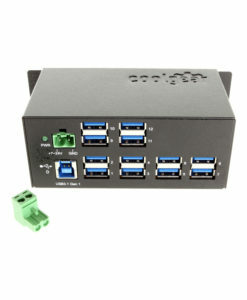 There are 2 Type-B upstream connectors on the 16 Port USB 3 Hub that offer a selectable rocker switch. Either Port A or Port B can be used to control the downstream ports on the device. Both ports can be connected to a host or another USB 3.0 Hub. These connectors support standard and screw-lock type USB cables. The 16 port USB 3.0 USB Hub has certain accessories that work with it. These accessories are what you can order if needed.